Total L * W: 9.5 x 8.5cm/ 3.74 x 3.35in. 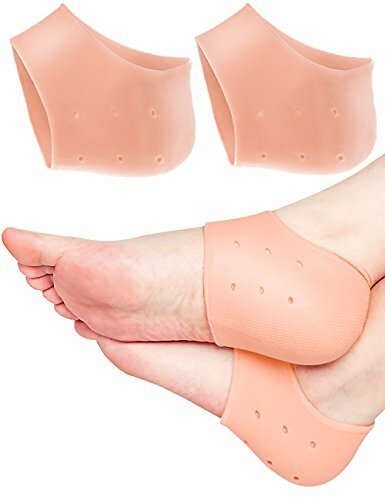 WHAT'S THE HEEL PROTECTORS HEEL PADS? ① Simply, the pad can be used to protect your heel foot. Toe Glow heel pads are helpful for you, reduces muscle fatigue, release feet's stress. ② Get back to taking steps with confidence and in comfort! It absorbs shocks and returns impact energy just like the fat pads naturally in your feet. The Gel Heel Socks moisturizing your dry cracked heels. Teacher, doctor, airline stewardess, pilot, high-heeled shoes lovers, office lady, the elderly, long standing time people and who has the bunion bother or other pinky finger 's disease. 1. Hand wash it with soap and warm water, then put it in a vent place and dry naturally. 2. It is viscous after washed, please applying some baby powder on the gel pads when you find it is sticky. √ THE BEST HEEL PROTECTION: Plantar fasciitis heel cushion will immediately relieve your uncomfortable heel pain! Heel protectors help to relieve chronic severe heel pain and discomfort from your bone spur, aching feet, stress fractures, sore hurting heels, cracked heels. √ 2 PIECES PER VALUE PACK: One size fits most feet! Comfortably can be worn under snug socks with shoes, boots or heels in daily life. Great heel pad for long standing time people. √ HIGH QUALITY MATERIAL: Made of soft and stretchable gel. Breathable air holes with non-slip design, moisturize your skin, soften the calluses and corns. Give you a glossy feet like newborn's foot. √ INSTANT PAIN RELIEF: This heel cushion effectively absorbing shock and impact while walking, alleviate pain from blister or corn. Perfect bone spur support for your active lifestyle. √ A GREAT GIFT FOR FOOT: Compact size, lightweight and portable for your feet's health. Friendly customer service for every customer. Give more attention to your feet from now on, you will get a beautiful foot that everyone admires.